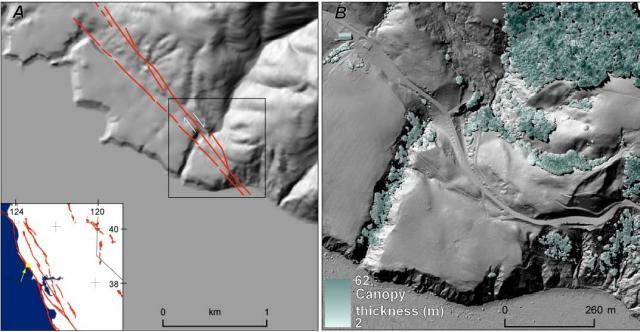 High-resolution topography characterizes landform geometry at scales at which geomorphic processes operate. A) Widely available 10 m per pixel National Elevation Data (NED) with San Andreas Fault (SAF) traces (last slippage here in 1906 of 1-2 m) overlain in the Fort Ross area of coastal northern California (inset yellow rectangle). Box shows location of B. B) 1 m per pixel full feature airborn laser swath mapping (ALSM) digital elevation model with canopy thickness in green. NED data are from US Geological Survey. EarthScope ASLM data are from http://www.opentopography.org. This material is based on services provided by the Plate Boundary Observatory operated by UNAVCO for EarthScope (http://www.earthscope.org) and supported by the National Science Foundation (No. EAR-0350028 and EAR-0732947). LiDAR data were gathered and processed by the National Center for Airborne Laser Mapping. Figure by Ramon Arrowsmith.